Jesus told us to love our neighbor as ourselves and Jonathan loved David “as he loved himself” fulfilling this Royal Edict from Christ (Mark 12:31). Jonathan risked his life for David because, “Saul’s anger flared up at Jonathan and he said to him, “You son of a perverse and rebellious woman! Don’t I know that you have sided with the son of Jesse to your own shame and to the shame of the mother who bore you? As long as the son of Jesse lives on this earth, neither you nor your kingdom will be established. Now send someone to bring him to me, for he must die!” “Why should he be put to death? What has he done?” Jonathan asked his father. But Saul hurled his spear at him to kill him. Then Jonathan knew that his father intended to kill David”. Jonathan understood that he would be next in line for the throne if David was taken out of the way and could have easily betrayed David and had the throne of Israel for himself, but Jonathan’s love and loyalty for his friend David was evident by his selfless act of saving David’s life. 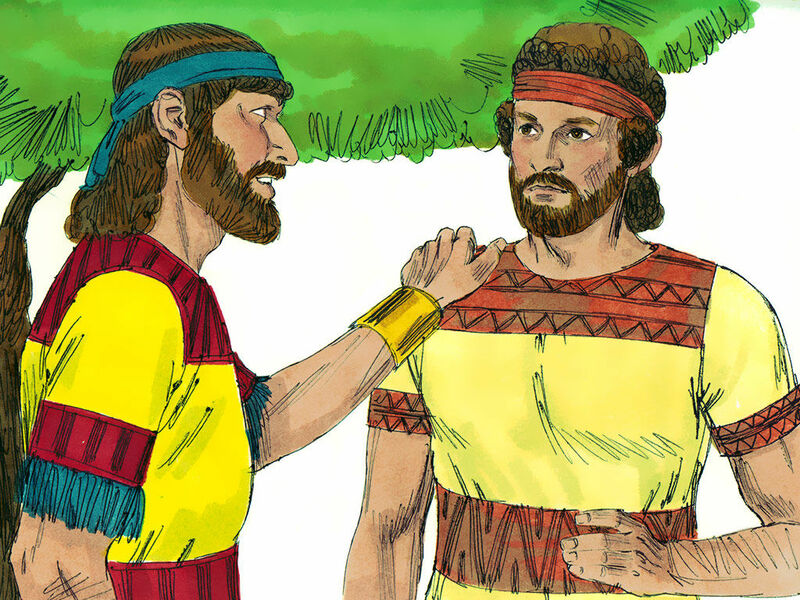 Jonathan was willing to risk his own life for his friend David and with the understanding that Jonathan would sacrifice his chance to rule Israel. David’s friendship was more important that the throne of Israel to Jonathan. Jonathan loved David more than a brother and he proved it by his actions in I Samuel 20. So Jonathon sent a messenger boy to shoot arrows for the signal that it was not safe for David to return to King Saul’s presence for he would surely be killed. What a touching show of affection that Jonathan showed David because, “After the boy had gone, David got up from the south side of the stone and bowed down before Jonathan three times, with his face to the ground. Then they kissed each other and wept together—but David wept the most. Jonathan said to David, “Go in peace, for we have sworn friendship with each other in the name of the LORD, saying, ‘The LORD is witness between you and me, and between your descendants and my descendants forever.’” Then David left, and Jonathan went back to the town”. 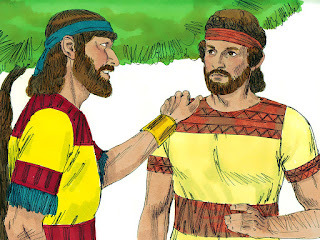 David showed such respect to Jonathan that he “bowed down three times before Jonathan“, even though David knew that God had anointed him to be the eventual king. Here is the future King of Israel; the greatest earthly kind that Israel would ever have, bowing to the son of is enemy, King Saul. And “then they kissed each other and wept together – but David wept the most”. The fact is that friends are indispensable in this life. The older a person gets the more valued their friendship becomes. Many friends are closer than brothers or sisters are to each other. There is something special about having a friend that you can confide in, tell your troubles too, and share your life with. It has been said that a sorrow shared is halved, but a joy shared is doubled. Proverbs 27:10a says, “Do not forsake your friend or a friend of your family” because you may need that friend in a day of trouble. The value of friends is one of the most important things in a person’s life: Their worth is not diminished by time, not devalued by inflation, not worn out by use. Dear Lord, we thank You for our friends! Help us to work to make our friendships stronger. Help us to be the friend to someone today. In the Name of Jesus, Amen.